CNN Press Release - Award-winning producer Kathy O'Hearn has been tapped by CNN to executive produce chief international correspondent Christiane Amanpour's forthcoming program on CNN International, it was announced today by Tony Maddox, executive vice president and managing director of CNN International. O'Hearn, who has more than 30 years of experience producing for both broadcast and cable networks, returns to CNN in preparation for the September launch of the New York-based, half-hour weekday program set to air during European prime-time on CNN International and on Sunday afternoons on CNN/U.S. "Kathy and Christiane will make a formidable team," said Maddox. "By combining Kathy's track record of news-making interviews and award-winning show production with Christiane's journalistic tenacity and global recognition, we have created a signature show that will be the heart of the schedule." O'Hearn returns to CNN after working at ABC, where she was most recently involved in the network's coverage of the 2008 U.S. Presidential election. She previously served as executive producer for 'This Week With George Stephanopoulos' for three years, helping to reposition the Sunday morning talk show while securing consistent ratings growth. She has been recognized with many awards throughout her career, including the Walter Cronkite Award for political reporting in 2009 and 2007; Emmy Award for Elian Gonzalez coverage in 2000; Peabody Award for 'ABC 2000' in 1999; Overseas Press Club Award for coverage of the AIDS crisis in Thailand in 1999; and two Edward R. Murrow Awards for coverage of the Red River, North Dakota flooding in 1999. The new Amanpour show comes amid major growth at both CNN International and in CNN's international newsgathering resources. The repositioning of CNN International includes an ambitious programming schedule that is being bolstered by more than six new prime-time programs in 2009, culminating with the Amanpour launch in September. Since the fall of 2007, CNN has continued to open new editorial operations and production centers while adding more than a dozen correspondents across Europe, Africa, the Middle East, Asia and Latin America. Connect the World will join the dots of stories and events by exploring how an event or circumstance in one part of the world can have significant impact and reach elsewhere. It's the connections - or links - that matter. During this hour, CNN will spin the globe around each story; diving into its past, looking to its future, and highlighting the people, places and problems that inform it. Consider the recent attacks in Mumbai: In this case Connects would explore the ramifications felt in Pakistan, Israel and the UK, the intervention and condemnation of the world's political community, the history of unrest within India, and the long-term global consequences of the attack. Guided by our Field Intelligence, Connects will journey into the multidimensional character of global events. - Content commissioned from the best of CNN's International Newsgathering. - Sharp analysis from the Connections Crew, a cast of regular contributors who are experts in their fields, whether it be finance, geopolitics, specific regions or otherwise. - Dynamic films, cyber dialogue and cutting edge graphics. Presented from London and sometimes from the road, Connect the World takes viewers on a sweeping journey across continents, beyond headlines, and into the histories, possibilities, and depths of the stories that are changing our world today. Connect the World is intelligent viewing for the internationalist in an interdependent world. CNN Press Release - With G-20 looming, CNN International harnesses its newly expanded newsgathering operation with an ambitious slate of new programming, and a comprehensive audience engagement initiative, to search for global solutions and personal success stories amongst the daily headlines of lay-offs and bail-outs. "We want to get the world view on how people are navigating, surviving and thriving in these difficult times," said Katherine Green, senior vice president of CNN International. "With correspondents based around the world, we will bring regular updates of how different countries are tackling the issues, and we also want to hear directly from people themselves and put their own stories at the heart of our programming." This global user-generated content initiative will sit alongside CNN's extensive on-air commitment to showcase not only the challenges but also the opportunities arising from the economic situation. The newly launched business show ‘Quest Means Business', hosted by business expert Richard Quest, leads the network's coverage with a combination of A-list interviews and regular real-time ‘tweeting' with viewers via Twitter. From the streets of Mumbai to the cafes of Paris and the sushi bars of Tokyo to the London Stock Exchange, CNN brings you the human stories of the recession and the road to recovery, as well as the jargon, numbers, company statements and share prices from the corporate world to give the full perspective from both the boardroom and the high street. The TV output will be complemented by a full interactive companion site at www.CNN.com/recovery, which hosts a customized, interactive Google Earth map featuring stories, videos, blogs and iReports that represent a snapshot of the global recession. The map also includes introductory videos from CNN correspondents around the world that show how their local regions are dealing with the recession. The launch of ‘Road to Recovery' coincides with the expansion of CNN's programming line up, including ‘Quest Means Business' and soon to be enhanced by additional shows anchored by European talent like Becky Anderson and Fionnuala Sweeney, and culminating later this year in a nightly interview show hosted by internationally acclaimed chief international reporter Christiane Amanpour. "Richard's business expertise, coupled with that of other presenter colleagues and a roster of correspondent reports from around the world, will bring a breadth of reporting that we doubt you'll see elsewhere" added Green. "And that's what you need on this most globally interconnected of stories." Together with ‘World Business Today' anchored by Andrew Stevens from Hong Kong, Charles Hodson from London and Maggie Lake from New York at 1530 and 2100 HKT, other weekday programs driving this ‘Road to Recovery' coverage include ‘Quest Means Business' at 0200 HKT and ‘International Desk' hosted by Hala Gorani from Atlanta at 0000 HKT. Taking full advantage of CNN's global resources, these destination programs will be instrumental in covering the G-20 on April 2 for the network. Richard Quest, Charles Hodson and Paula Newton will report live throughout the day from the ExCel center while Nic Robertson, Phil Black and Jim Boulden will offer reports on local reaction to the economy-focused summit. White House correspondents Suzanne Malveaux and Ed Henry will be present covering U.S. President Barack Obama's first trip to Europe since being elected president. iReport.com is reaching out to users, specifically those who live in a G-20 country, to submit videos and photos of the message they want their representatives to pass on at the summit and what changes, if any, they expect to occur. CNN's iReport correspondent, Errol Barnett, plans to take some of these G-20 focused iReports, highlight them in special segments on air and designate the iReporters as regular contributors during CNN's coverage of the G-20. 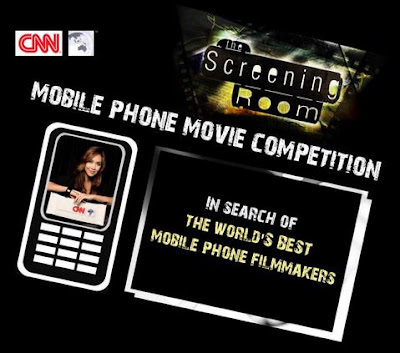 'The Screening Room Mobile Phone Movie Competition' is inviting viewers to submit short films on any subject of up to five minutes. A panel of judges, including The Screening Room’s presenter Myleene Klass and the program’s production team will select the best entries which will feature on the program’s website. The overall winner’s film will be shown on a future edition of The Screening Room Xtra on CNN. All entries must be received by 25 May 2009. Full details and production tips are available online at www.cnn.com/thescreeningroom. Viewers must submit their films via CNN’s YouTube page www.youtube.com/cnn. The Screening Room is CNN’s monthly film review and magazine program that reports on all the latest news and reviews from the cinema scene, keeping CNN viewers up-to-date with the most important developments from the industry. With in-depth interviews, reviews and behind-the-scenes reports, The Screening Room is present at all the big global film events worldwide. Christopher Smith is on CNN International for CNN Today (London), filling in for Jenny Harrison. Anderson Cooper is set to be the first speaker in a series of talks hosted by the University of Delaware. "UD Speaks is dedicated to bringing world-class leaders to the Delaware campus to educate, enlighten and engage the University community. Guest speakers have their own perspectives on the world and have, in some way, made their imprint upon it". Cooper heads to the campus on April 15. Shinan Govani of Canada's National Post drops the news about John Roberts' date for his recent induction into the Broadcast Hall of Fame. TV Newser adds more details. In an unprecedented programming move usually reserved for live breaking news events, CNN will devote an entire week of coverage to the biggest story facing our nation: the global economic crisis. Beginning on March 16 and continuing through March 20, CNN will utilize its vast domestic, international and online reach to help viewers make sense of the complicated and often overwhelming financial fallout. Highlighting the stories of everyday Americans and offering possible solutions, resources and ideas to help navigate through the crisis, CNN will offer a diversity of thought, approach and opinion from various guests including entrepreneurs, stimulus recipients, banking experts, and analysts. The all encompassing programming effort aims to help viewers understand just who is accountable for the current situation, explore whether or not the stimulus money is being well spent and identify those in power who may be able to bring an end to the crisis. On CNN/U.S., all dayside and primetime shows, anchors and correspondents will focus on the economic crisis both at home and around the world. Leading the coverage will be CNN’s Money Team which includes CNN chief business correspondent Ali Velshi, CNN business correspondent Christine Romans and CNN personal finance editor Gerri Willis, in addition to a diverse array of expert practitioners, who will all examine the key issues in play including jobs, housing, healthcare, debt, and the impact of the stimulus. Velshi will sit down with Treasury Secretary Tim Geithner at the US Treasury as he obtains exclusive behind-the-scenes access. On Anderson Cooper 360, Anderson Cooper hits the road and will report from five U.S. cities (Los Angeles, New Orleans, Detroit, New York and Tampa) to cover how Americans have been affected by the economic crisis and what they are doing to pull through. “Devoting a full week of coverage to one topic that affects all Americans and the worldwide community is a first for us," said Jon Klein, president of CNN/US. "As journalists, we owe it to our domestic, international and online audiences to provide them with as much reliable, straightforward information so that people can make up their own minds during these critical times." CNN International’s special coverage will focus on making sense of the economic downturn while looking ahead at the road to recovery. This coverage also includes a new segment called Faces of Recession, which profiles ordinary people whose lives have been turned upside down because of the recession and how it has forever changed their lifestyles, and daily reports from CNN correspondents all over the world illustrating the effects of the recession in their local markets. Richard Quest, host of Quest Means Business, will lead the daily coverage and provide up-to-the-minute reports and analysis on the global indicators, seeking to connect the dots of the global economy for both CNN International and CNN/U.S. HLN’s Clark Howard will provide CNN viewers with consumer tips during CNN Newsroom shows throughout the week. Howard is a renowned consumer advocate and radio host whose television show Clark Howard airs each weekend on HLN. CNN.com will feature in-depth reporting, interactive multimedia features and video – both live and on-demand – across the entire site, focusing on how industries, companies, and everyday people are finding creative ways to navigate “the new normal.” CNN.com also will showcase analysis and commentary from a distinguished roster of economists and other experts regarding when and how the world economy will turn around; landing a job at a time of widespread layoffs; job creation in green industries; and how consumers can build their savings and protect their investments. Additionally, users can access a special report called “Where the Jobs are,” offering up- to-the-minute reporting on industries and companies that are hiring, as well as latest trends in the job market; and a customized interactive map providing a closer look at how globalization has increased the world’s economies’ dependency on one another. As part of CNN’s Impact Your World initiative, at CNN.com/Impact users will find ways to help those facing foreclosure and eviction, loss of utilities and hunger. CNNMoney.com will examine the current state of the economy and how it’s affecting people across the country, as well as provide users with possible solutions to solve their own money problems as it relates to their jobs, homes and retirement. Beginning Monday at www.CNNMoney.com/rescue, users can access the exclusive CNN/Fortune Recovery Index, which tracks the government’s weekly progress between now and last Fall across seven key indicators – jobs, real estate, business confidence, inflation, credit markets, U.S. stocks and global stocks. Additionally, CNNMoney.com will debut a new video series next week: "The Fixers," introducing the key players charged with fixing the economy; as well as a new text series entitled “You’re hired!,” profiling people successfully landing jobs in the current economic climate. iReport.com, the network’s user-generated online news community, is collecting photos and videos from its users about how they tackle their personal economic struggles for the first iReport Economy Challenge. Available at www.iReport.com, the week-long series will share everything from how to make the best brown bag lunch to penny-pinching lessons from Grandma to thrift store shopping tips, empowering users to have fun while being financially responsible. CNN Student News, CNN’s cost-and-commercial free news program for middle and high schools, will focus on explaining the complex topics associated with the current economic crisis to young people. Additionally, CNN Student News will feature compelling insight from its teenage viewers about how the recession is affecting them on the week-daily program and on the blog, A to Z with Carl Azuz. Finally at www.CNNStudentNews.com, parents and educators can access online materials – including the CNN Student News Financial Glossary - to help young people better understand this intensely complicated economic situation. CNN International recently introduced new network ID's. Gone is the familiar booming voice of James Earl Jones - that's been replaced by a CNN International anchor or correspondent. There's currently 11 different ID's in the series covering the following countries: Egypt, Australia, France, China, America, Morocco, United Kingdom, Germany, Russia, South Africa and Indonesia. Below is an example of the 5 second and 10 second versions of Egypt, voiced by correspondent Ben Wedeman. Anderson Cooper is set to make another appearance on "The Ellen DeGeneres Show". Cooper, who recorded the piece with Ellen last week, stops by and discusses his show "Anderson Cooper 360". The exclusive interview airs this Thursday, March 19. Check your local listings or visit www.ellentv.com for more information. CNN International demonstrates its continuing commitment to Africa with the launch in March of brand-new weekly programming dedicated to showcasing the continent’s cultural, sporting, and business highlights. ‘African Voices’ and ‘Africa Inc’ will respectively focus on engaging African personalities and vibrant business stories and will serve together with the popular ‘Inside Africa’ strand to give increased prominence to Africa in all its diversity. The new programming complements the existing news, economic, political and social output which itself has increased notably since the network expanded its newsgathering presence in Johannesburg, Kenya and Lagos a year ago. Further expansion and investment is planned to support existing Johannesburg bureau staff in the coming months. In addition to new programming and additional staffing, CNN is investing in local partnerships with key industry events as a signal of its commitment to local integration, such as IMF Tanzania, and Indaba, South Africa. It also continues its longstanding commitment to African journalism in the form of the CNN MultiChoice African Journalist of the Year awards. CNN has been particularly dedicated to reporting important stories as diverse as the continuing struggle for democracy in Zimbabwe; preparations for the FIFA World Cup 2010; Nelson Mandela’s 90th birthday celebrations (Robyn Curnow’s ‘Mandela at 90’ report won first place for international reporting at the New York Association of Black Journalists in February 2009); Brent Sadler reporting from Victoria Island, Lagos where a sea defence system is battling against coastal erosion, and David McKenzie travelling on a homecoming with Kenya’s Olympic gold medal winner, Nancy Lagat. CNN also continues to cover the ongoing developments in Sudan and Chad. The new programming commitment builds on the hugely successful long-running Inside Africa strand, and sits alongside topical initiatives such as the year-long ‘World Cup 2010 Ready to Play’ programming. CNN’s programming on Africa is presented by a diverse line-up of expert Africa commentators, including Nkepile Mabuse, Isha Sesay, Robyn Curnow, David McKenzie and Christian Purefoy. NEW ‘African Voices’, a half-hour weekly programme, showcases engaging African personalities, across all areas from business and politics, to music, the arts and sport. Utilising CNN’s resources, the programme offers viewers a uniquely personal viewpoint; an intimate, candid, up-close discussion. Viewers of ‘African Voices’ will find a different perspective on Africa from that often seen in the mainstream media – thoughtful insights and observations of the energies and confidence driving the success of the continent’s nations, people and individuals. NEW ‘Africa Inc’, a unique weekly segment contained in CNN’s new flagship business programme, ‘Quest Means Business’, highlights stories that would otherwise go untold, stories that spotlight a region that is roaring onto the world financial stage with the promise of a bright future. Viewers will discover the forces that allow such regions to flourish and succeed, when so much of the planet is suffering financially. The programme highlights key industries breaking new ground; meet first-hand innovative leadership figures who are willing to think and reveal landmark management styles that are behind this new era of business success. In addition to these two new programming strands, the weekly programme ‘Inside Africa’ remains a cornerstone of CNN’s Africa programming, and is its longest running feature programme. Now in its 10th year, the programme’s host Isha Sesay takes viewers on a weekly journey across the continent, savouring the rich flavour and culture that is distinct to Africa. As well as these weekly programmes, throughout 2009 CNN International continues to examine the progress of preparations for the world’s biggest sporting event, the 2010 FIFA World Cup in South Africa, through a series of regular updates and progress reports, ‘World Cup 2010: Ready to Play?’. In February 2008, CNN broadened its newsgathering presence in Kenya, Nigeria and South Africa as part of a robust editorial investment in bringing all facets of Africa’s story to the network’s international audiences. Correspondents Robyn Curnow and Nkepile Mabuse were appointed to the Johannesburg bureau; David McKenzie in Nairobi and Christian Purefoy in Lagos. Recent stories in the last 12 months include: Nelson Mandela’s 90th birthday celebrations; ongoing coverage of Zimbabwe despite being banned from region; continuing coverage of the preparations for the 2010 FIFA World Cup; reporting of Somali pirates plus special coverage of the Kenyan violence and uprising one year on. The CNN MultiChoice African Journalist Awards are the premier accolade for excellent journalism across the continent. Last year’s awards attracted entrants from 44 African countries with 23 finalists from all four corners of the continent. Now in their 14th year, the African Journalist Awards are the oldest and most diverse competition of their kind in Africa, and demonstrate CNN’s commitment to the development of media in Africa. CNN is active on the ground in Africa not just though its strong editorial coverage but also through the support it lends to local industry events. In 2009, CNN’s on-air talent will be present at local events, forums and trade fairs, including ‘Inside Africa’ host Isha Sesay at IMF Tanzania focusing on sustaining and building Africa’s recent economic success; and Richard Quest at INDABA South Africa.